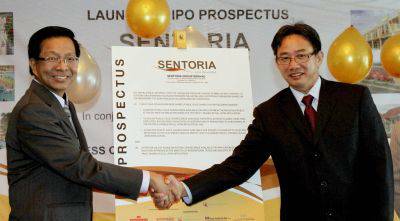 More visibility: Sentoria joint MD Datuk Jimmy Chan (left) and Gan at the launch of the company’s prospectus. Gan says a listing on the stock market would make it easier for the company to attract potential investors and business partners. KUALA LUMPUR: Property developer, and leisure and hospitality company Sentoria Group Bhd, which aims to raise RM51.6mil from its initial public offering (IPO), intends to invest the bulk of the proceeds on a second theme park in its Bukit Gambang Resort City (BGRC) in Kuantan, Pahang. Sentoria joint managing director Datuk Gan Kim Leong said that the company had allocated a capital expenditure (capex) of RM48mil for a Safari Park, which would boost the number of visitors to BGRC. “The park will open in stages from the end of this year,” he said at the launch of the company's prospectus yesterday. Sentoria public and investor relations head Nasiruddin Nasrun said he was optimistic the Safari Park, spanning 35.7ha in Gambang's secondary jungle, would follow the success of the company's first theme park, known as Bukit Gambang Water Park, which had already attracted more than one million visitors since BGRC's opening in July 2009. Sentoria is the developer and operator of BGRC. According to Gan, the hospitality business contributed about 30% to Sentoria's total earnings, with the balance 70% coming from its property development division. Nasiruddin said the company expected to grow the contribution from the hospitality business to 50% by the time BGRC was completely developed in 2018. “But we do expect to reach 50% much earlier, perhaps in the next couple of years,” he said. Gan said a listing on the stock market would enable the company to create more visibility and make it easier to attract potential investors and business partners. He also said it was timely to float the company despite the current global economic uncertainties. “We cannot foresee if the global economy will be good or bad, so any time is the best time,” Gan said. Nasiruddin added that Sentoria was no stranger to an “economic downturn”. “We embarked on BGRC during the global financial crisis in 2007 and 2008. So, we are no stranger to economic downturns,” he said. Apart from the capex, the balance IPO proceeds will be used to repay bank borrowings and defray listing expenses. En route to a listing on the Main Market of Bursa Malaysia by the first quarter of this year, Sentoria's IPO entails a public issue of 60 million new shares and an offer for sale of 40 million promoters' shares. Of the 60 million public shares, 20 million are allocated for public balloting and 10 million for eligible directors, employees and business associates of the group at a price of 85 sen each. About 30 million shares will be allocated for private placement at 87 sen apiece. The 40 million promoters' shares allocated for bumiputra investors are priced at 87 sen each. AmInvesment Bank Bhd is the principal adviser, managing underwriter and joint placement agent for the IPO, while Kenanga Investment Bank Bhd is the joint placement agent. SINGAPORE: Singapore's property cooling measures could deter investors from residential property and into stocks, according to investment experts. The latest measures imposed an additional 10% stamp duty on foreigners buying private homes, a move that could affect demand and investment strategies, said DBS Group Research. “Owner-occupier buyers are likely to hold back in anticipation of a dip in prices,” said the research house, which expected home prices to retrace by 5% this year - a muted impact due to the low interest rate environment. Potential buyers already appear to be adopting a wait-and-see attitude, suggesting they may place their cash into stocks instead. Just what effect the cooling measures might have on the share market was also a hot topic among most investors at a recent roadshow by CIMB Singapore, held in Asia and the United States. “That was the question investors asked. My view is that there are other factors that drive stock market liquidity,” said CIMB Singapore research head Kenneth Ng. He pointed out that retail participation in the stock market tapered off in 2010 and last year. That coincided with the opening years of the two casinos and very strong transaction volumes in the property sector. Tan of Standard and Poor's said confidence needed to improve significantly before shares would go up. That appears to have happened already somewhat. The benchmark Straits Times Index has gained 10.2% this year to 2,916.26 points. “The risk appetite has definitely come back a bit. But the eurozone debt issue is still a dampener. “And global growth as well as Asia's is slowing. Those are two big issues that will continue to drive interest in equities,” said Tan. Many potential property investors may be moving into shares while they wait and see how the cooling measures play out on prices. There has been much talk since the Dec 8 stamp duty came into effect that prices would fall, but Tan of Chesterton Suntec is not convinced. “There's too much liquidity in the market and borrowing costs are low. I don't think property prices are coming down soon, not even in a slow growth environment,” he said. The Watertown project in Punggol has achieved strong sales since its preview on Jan 18. OSK-DMG Research attributes the robust showing to the penchant among Singapore property buyers for mixed developments. But the research house expects primary transaction volume to fall by 20% year-on-year this year. PEKAN: Prime Minister Datuk Seri Najib Razak officially launched two integrated housing and community centres for the poor in Kampung Padang Rumbia and Kampung Pulau Serai recently that will benefit 162 families. The housing project, part of a nationwide effort to eradicate poverty, involved the full support of the private sector. Under this project, families were given furnished homes and provided with income-generating ventures such as agriculture and aquaculture activities and livestock rearing. The housing area was also completed with facilities such as food processing centres, ICT lab and handicraft production centres. Najib said no Government allocation had been given for the project and it was funded by the private sector. “It simply reflects the close cooperation between the Federal and state governments with the private sector,” he added. Najib also said since becoming the Prime Minister nearly three years ago, he had always been open to all manner of new ideas resulting in the implementation of various Government policies. A benchmark for any Govern-ment’s authority was in the contestation of ideas, he added. “The free housing project for needy people is an example born from these exchange of ideas,” he said. On the housing and community centres, Najib said each house, measuring 92.9 sq m, was fully furnished with a free gas cylinder for cooking. Fifty families received their house keys from Najib during the function. Later, at the Kampung Pulau Serai integrated housing project, the Pekan MP officially opened the Kedai Rakyat 1Malaysia which he described as the largest mall concept in Malaysia. Among the facilities available were a landscape industry centre, fiber boat production centre, handicraft centre and an ICT resource centre. Najib also gave away house keys to 112 families. The first integrated housing and community centre project was launched in July, 2010, involving 60 families in Bukit Kenau, Pulau Manis here. PROPERTY developer Tebrau Teguh Bhd, which will see the involvement of construction tycoon Datuk Lim Kang Hoo of Ekovest Bhd in the company, has been chosen by the Johor government to develop 161 hectares of land in the southern state. The land, located in Pengerang, Kota Tinggi, within the oil and gas industry hub, is to be a comprehensive mixed development that complements Petroliam Nasional Bhd’s US$20 billion (RM60.8 billion) refinery and petrochemicals integrated development. Tebrau Teguh obtained its letter of appointment from the state government on January 30, it told the stock exchange late yesterday. The land is owned by the state. Meanwhile, Lim and Tebrau Teguh’s biggest shareholder, Kumpulan Prasarana Rakyat Johor (KPRJ), are launching a takeover of the property developer. Tebrau Teguh said, in a separate stock exchange filing yesterday, that KPRJ plans to sell a 33.15 per cent stake in Tebrau Teguh to Iskandar Waterfront Holdings Sdn Bhd (IWH) for 76 sen a share, or RM168.7 million in total. The move will result in IWH having to make a mandatory general offer for the rest of Tebrau Teguh’s shares at the same price. 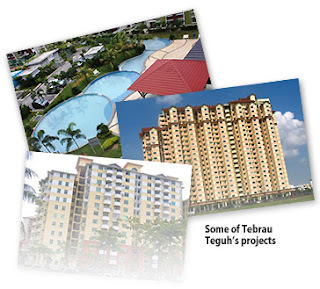 KPRJ, which is the Johor state’s investment arm, currently owns a direct 41.15 per cent stakein Tebrau Teguh. According to Tebrau Teguh, IWH is owned by KPRJ and Credence Resources Sdn Bhd. It did not state their exact shareholding in IWH, saying only that IWH’s directors are Lim, Lim Hoe, Lim Keng Cheng, Lim Chen Herng, Datuk Shahir Nasir, Datuk Ayub Mion and Johar Salim Yahaya. Interestingly, Lim also owns 70 per cent of Danga Bay Sdn Bhd (DBSB) – the master developer of the Danga Bay waterfront project in Johor – via Credence Resources. KPRJ owns the other 30 per cent of DBSB. Recent news reports have speculated that DBSB may be injected into Tebrau Teguh as Lim seeks to consolidate his investments. Tebrau, however, when queried by the stock exchange, said yesterday it was “not in any form of discussion with any parties” to buy DBSB. Lim, a prominent businessman in Johor, is also the co-founder and chairman of Ekovest. IWH’s offer price of 76 sen a share for Tebrau Teguh is just one sen higher than its last trading price. The stock, which was suspended on Monday this week pending the announcements that were made yesterday, will resume trade tomorrow. IWH and KPRJ are to enter into definitive agreements on the Tebrau Teguh purchase on April 29, at the latest. The mandatory offer will be conditional upon IWH and parties acting in concert with it holding more than 50 per cent of the voting shares in Tebrau Teguh.